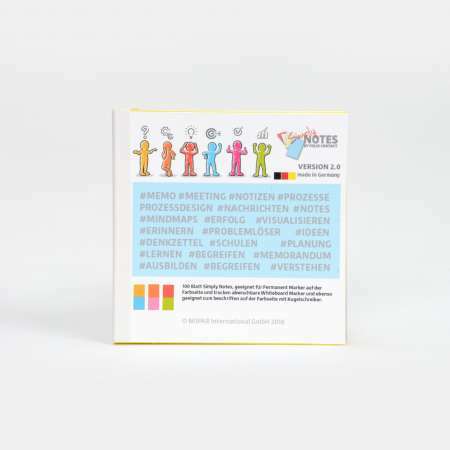 The new generation of sticky notes! Take notes on Simply Notes 1.0 and then hang them on any surface. 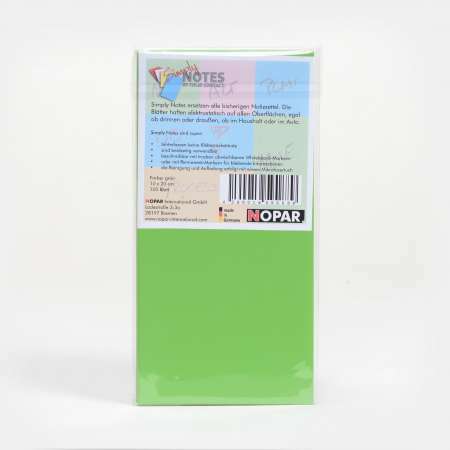 Your notes will stay in place for a long time! 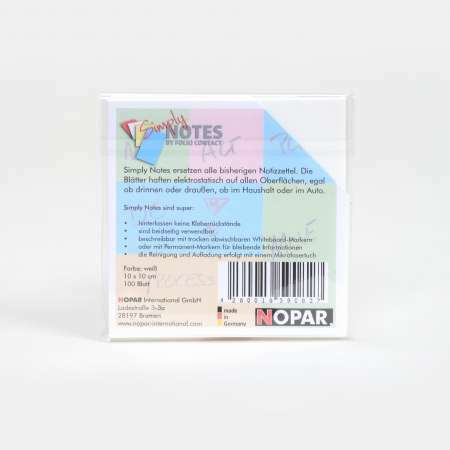 Simply Notes 1.0 are reusable when using of dry-erasable whiteboard markers. By using permanent markers the written information is preserved! Each sheet can be recharged by rubbing with a microfibre cloth. Available in five different colours (pink, green, white, yellow and blue) and two sizes (10 x 10cm and 10 x 20cm) with 100 sheets. Also in the practical transparent-box 10 x 20cm with 500 sheets. 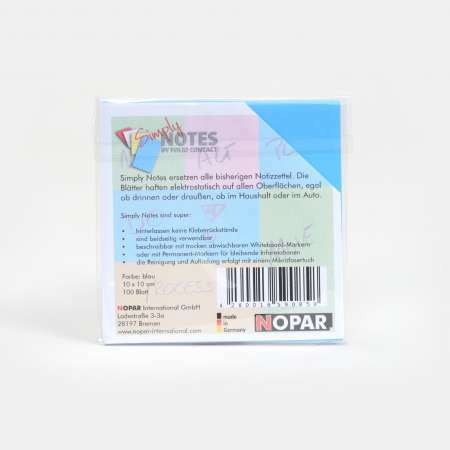 Simply Notes 2.0 is the second generation of sticky notes from Folio Contact. 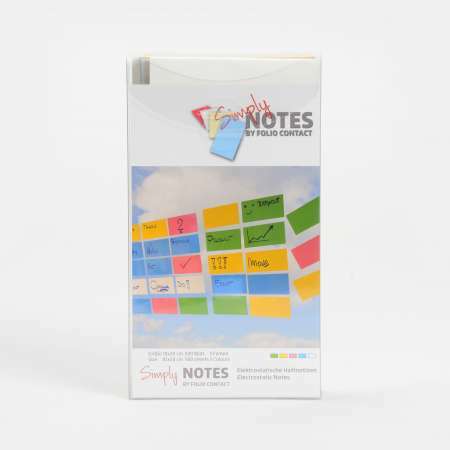 Make your notices on Simply Notes 2.0 and then hang them on any smooth surface. 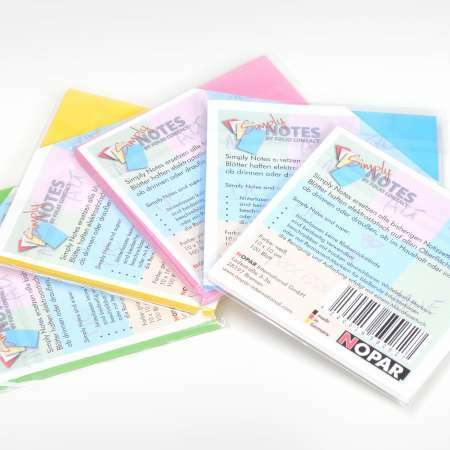 Your notes will be guaranteed to last anywhere, with no glue, no pins, no magnets and no tape. Each sheet holds on almost every surface due to its electrostatic charge. 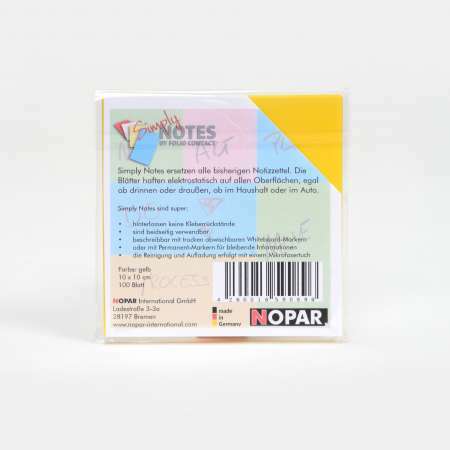 Since Simply Notes 2.0 is not coated, the medium leaves no residues on sensitive surfaces. The coloured side can be labeled with permanent markers and ballpoint pens. Permanent and whiteboard markers can be used on the white rear surface. The whiteboard pens can be wiped off and the notes reused up to ten times. Pencils with a soft lead can also be used. 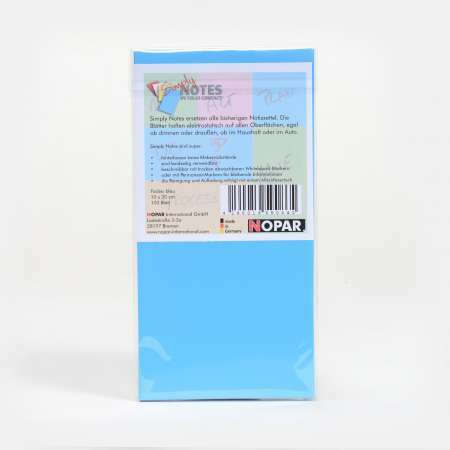 Folio Contact Simply Notes is an environmental friendly Flip-Chart Media, made of Polypropylen. 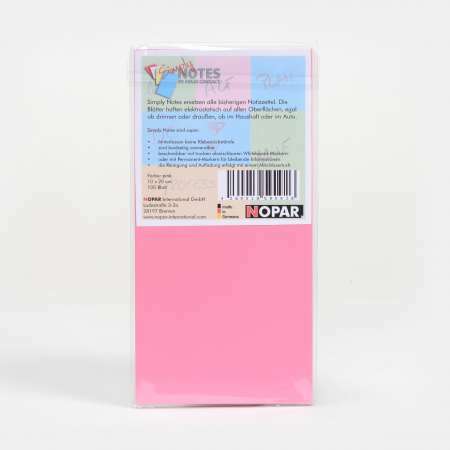 It has been developed and been produced by NOPAR International Inc. and patented under: EP 1326918 B1. 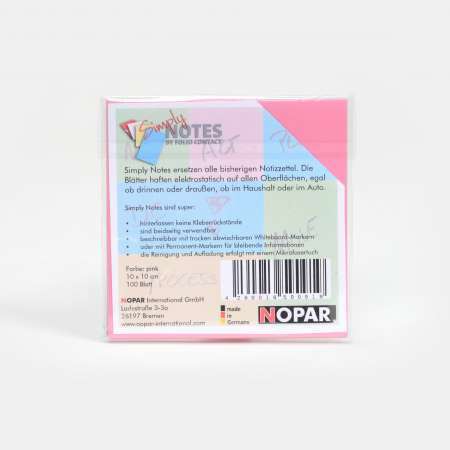 FolioContact Simply Notes is a special produced 3-layer coex cast PP-Film. The mid Layer is able to take on ionisation and keepit for at least 5 Years, depending on the storage conditions, packed and boxed at 40-50% rel. humidity, at 18°-22°C. The sheets are available in the sizes of 10x10cm and 10x20cm, with 5 different colours: pink, green, white, yellow and blue. Every package contains 100 sheets. Each sheet adhere to virtually any surface without any other tools, such as adhesive or pins disputes. 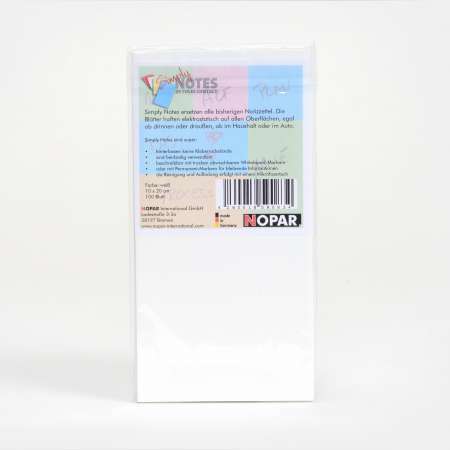 The film is ideally suited for use with non-permanent, or dry erase whiteboard markers. When using permanent markers, it will be not possible to clean the film surface again, exept when alcoholic cleaning solution is taken (please care about dangerous Goods Regulations). 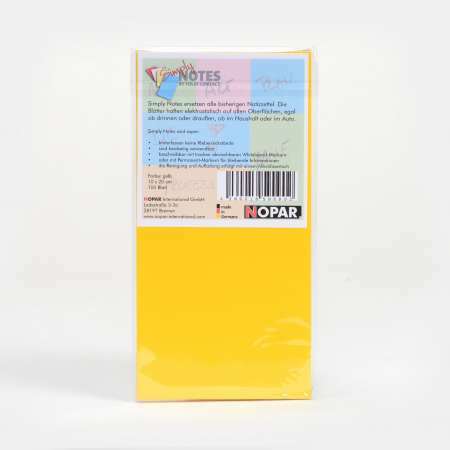 For further details please contact NOPAR NOPAR International Inc.
Folio Contact Simply Notes is not made for printing or individual printed artworks. 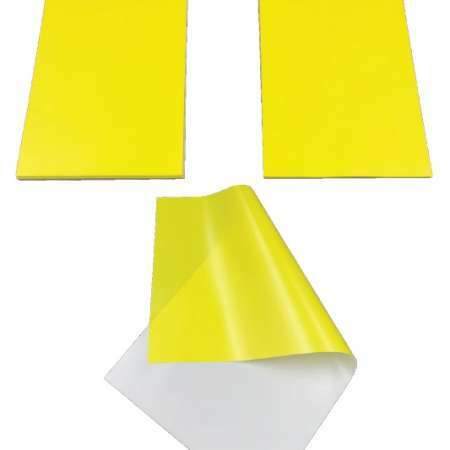 Folio Contact Simply Notes can be recycled, be disposed with the yellow bag and capable for energy recovery. Safety data sheets can be requested if necessary. 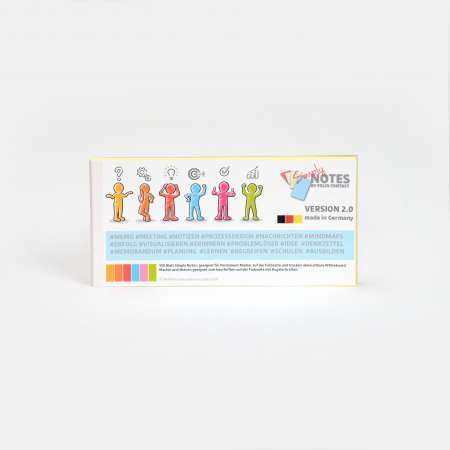 Simply Notes 2.0 is the second generation of sticky notes by Folio Contact. 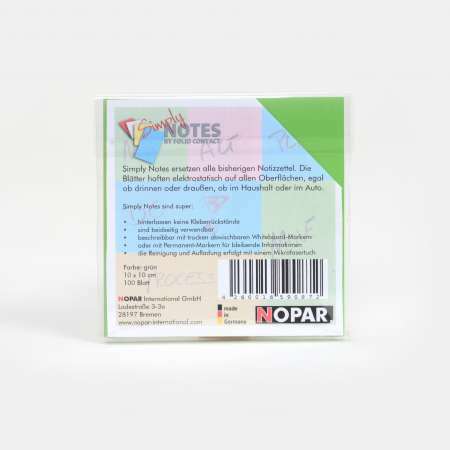 Do your notices on Simply Notes 2.0 and stick them on any smooth surface you want. The notes will stick for a long time, without any glue, pins, magnets or tape. Every sheet will stick to the surface, because of its electrostatic charge. 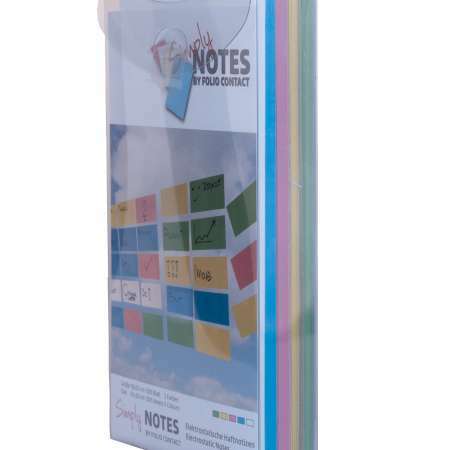 Simply Notes 2.0 are not coated and will not leave any residues on sensitive surfaces. The coloured front is writable with permanent-marker and ball pens. Permanent- and whiteboard-marker can be used on the white back side. Notices with whiteboard can wiped off and the notes are reusable up to ten times. It is also possible to write with a soft pencil lead on it. Writeable: With dry wipeable whiteboard-marker and ball pens. Permanent-marker are not wipeable.